An-nisbah: syariah economics journal is scientific journal containing work original lecturers, researchers, students and the care other has not been seen publicly or not being in publishing in the form of articles research and the idea conceptual about syariah economic problems. 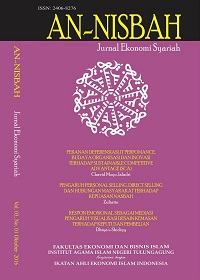 This jounal is published twice (April and October) every year and it was indexed by several several reputable indexing services such as: google scholar, Crossreef (DOI), Morareef, WorldCat, Mendeley, etc.This journal is published by the faculty of business and islamic economy (FEBI) State Islamic Institute Tulungagung (IAIN) with ties of Indonesian Islamic economists. The whole article can be accessed at address http://ejournal.iain-tulungagung.ac.id/index.php/nisbah.